Planning a conference can be intimidating. Venues? Expensive. High-profile speakers? Often busy and hard to get a hold of. Plans going awry the day of? Stressful. But delighting your audience with an actionable live event? Priceless. 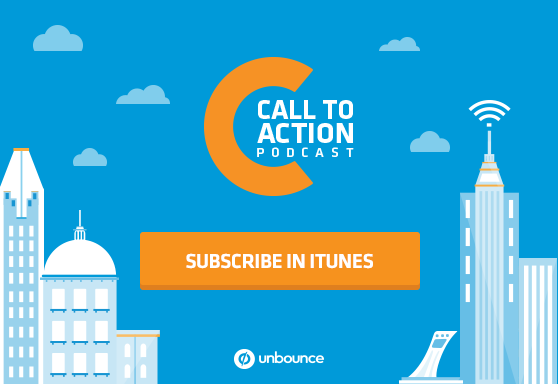 This episode of the Call to Action podcast is all about using video to create exceptional marketing experiences around your events. Wistia’s secret formula for wooing big-name speakers. How some of the biggest names in marketing are using video to hype their events. Whether you should gate videos or not. Using Video in Your Event Marketing: Before, During and After by Kristen Craft via Unbounce. In this episode: Stephanie Saretsky, Unbounce’s Multimedia Content Producer, chats with Stefanie Grieser, Unbounce’s Event Marketing Manager. Then, Dan Levy, Unbounce’s Content Strategist, interviews Kristen Craft, Director of Business Development at Wistia. Stephanie: Planning a conference can be intimidating. Venues? Expensive. High profile speakers? Often busy and hard to get ahold of. Plans going awry the day of? Stressful. But delighting your audience with an actionable live event? Priceless. Our events team has been prepping for the second annual Call to Action Conference this September. But this summer we decided to take the show on the road for four days of mini conference goodness, starting off with an event in New York City. But remember when I mentioned plans going awry? The NYC venue was packed, the speakers were hitting the stage and then Stef Grieser, our Events Strategist, found out some really bad news. Stephanie: The event team decided to make a joke out of it. When kicking off the afternoon portion of the event, Ryan Engley, our director of Customer Success and host extraordinaire, showed the picture of the crashed truck and of Jeremy’s text exchange with his wife. It made the audience laugh, and helped make the best out of a bad situation. With the worst-case scenario out of the way, the rest of the road trip went pretty smoothly. Now the events team is focusing all their hard work and energy into the Call to Action Conference this September in Vancouver. And it’s looking to be bigger and better than ever. Stef: There’s a lot that I’m excited about and a lot that’s gonna be bigger and, in my opinion, better than last year. And that goes from content to the food people eat, to roundtable discussions at lunchtime, to the after parties, to fun surprises throughout. So yeah. Stephanie: If that sounds like a good time to you, why don’t you join us? Visit CalltoActionConf.com for more information. Dan: So video marketing and event marketing are both hot topics right now. But they’re also both known to be kind of expensive, hard to pull off and even harder to measure from an ROI standpoint. You suggest combining these two things. Why do you think they’re a good match and that they work well together? Kristen: Yeah. First of all, I would like to refute one of those things about video being expensive. Because video certainly can be expensive, but I think it can also be done in a much more sustainable way and with a much more limited budget. It certainly takes a little bit of practice, but I think it’s like anything. It’s like writing or being a designer; it’s something that is an important skill to have, an important skill to have in-house. And bringing that skill in-house can help to make it a lot more repeatable in a non-expensive way or less expensive way. Dan: Totally, yeah. I have to say that they’re perceived to be expensive and complex and all that, but not necessarily. Kristen: Yeah. But I think in general, events can be a little bit tricky when you’re trying to gauge ROI. I mean I, myself, have tried to help us figure out how to gauge the ROI – WistiaFest, for example – and it is tough. I mean it’s hard to know really what the impact is of an event. Many branding opportunities in general have kind of murky ROI. But most companies, Wistia included, do opt to dedicate some money and effort to branding opportunities, even if they are a bit murkier. But I think it is a good match, back to your earlier question, because video just has such a strong impact on attendee happiness. So if you’re already spending $100,000 or $200,000 on an event and there’s something that you can do to double the attendee satisfaction rate — raise the energy in the room, make people feel more informed about a speaker they’re about to hear, more excited about a speaker that they’re about to hear — that’s pretty huge. I think if you’re already spending that money to throw the event, may as well go that last mile to make that sure people are feeling as good about it as possible. Dan: Let’s start by talking about using video before the event. We know that video can get people hyped up about the event, but hype doesn’t necessarily translate into ticket sales. So what are some tricks for making pre-event videos not just delightful and fun, but also persuasive to people who might still be sitting on the fence about whether they’re going to attend or not? Kristen: I like to think about alibis. You know, whether you’re selling a product or trying to sell tickets to an event, I often like to put myself in the shoes of a potential buyer and to try to understand what alibis they’re telling themselves or their coworkers for not buying or not attending. And I think that with events, it often comes down to two things. They are unsure about whether the content they’re going to learn is so valuable that it warrants being out of the office for a couple days. So that is one way in which video can really help people get beyond that alibi. If you can demonstrate, maybe even make a video of the speakers ahead of time, that people have really valuable stuff to share and in fact, they will get more out of that time than they would in the office, that it’s gonna be worthwhile for their career, for their company; that helps to get beyond that alibi. The other alibi that comes up a lot – and this one is a little bit funnier because I don’t think people are necessarily up front about it or even cognizant of it – is sort of a nervousness about what it will feel like to be at that event. Like, “Oh, I’m not gonna know anyone there. I might be the only person from my company attending. I’m such an introvert. This feels a little uncomfortable.” So video does a really great job at conveying the emotion behind a place or a situation. And if you can help to show that an event is peopled with lovely, friendly individuals who are about making everyone feel welcome, or that the event is curated in such a way so that it does feel very inclusive for anybody, I think that can go a long way in getting people over that second kind of alibi. Dan: I love the use of the term “alibi” because it suggests that we’re sometimes looking for excuses not to do something that we deep inside know that we should be doing. I think it’s just a very human thing. Kristen: Yeah. Because I mean ultimately, you’re not trying to convince somebody who doesn’t want to go to your event to go to that event. Like you want to find those people who want to but sort of have this discomfort or anxiety about it for some reason, and just help those people get over that. Dan: What an interesting and particular persona to market to. So you suggest embedding pre-event videos on dedicated landing pages, which is obviously something that we talk a lot about here, as well. And you use AWeber’s Ascent Summit Landing Page as a good example of doing that. What are some of the benefits of coupling conference landing pages with videos and how can this have an impact on conversions? Kristen: So there is a ton of data out there right now about how video can increase conversion on landing pages. And I know that you guys have done a good amount of writing about that. We’ve done a good amount of research around that and others have as well. There are lots of different numbers that are thrown out there, whether it’s like 80 percent or 100 percent or 200 percent. I think the consistent thing is that it has an impact on conversion. So I think that is a valuable thing. The same before with the event in general, I think the same holds true for a landing page. Like if you are going through the trouble of building a landing page, why not go that last mile to make it as compelling as possible? I think there’s a human – an emotional – side of this, as well. An unarguable fact about video is that it helps explain things better than almost any other medium aside from being in person. So if you want to explain why your conference is different from others, or you want to explain why the speakers are so delightful. If you can show those things rather than just tell them with text or even with the images, that really will get you so much further with the people who are visiting that landing page. Dan: Yeah, you said that if you’re going to create a landing page, why not put a video on it because you know that it does increase conversions. But I guess the other side of that is if you’re gonna go through the trouble of creating a video, why not put it on a landing page where it has a better chance of actually persuading people to do what you want them to do, and then giving them an outlet to go ahead and do that so that they reinforce each other in that sense, I guess. Kristen: Yeah, absolutely. You know, we bump into so many people who are making these incredible videos about their company or about their product. And then maybe they’ll just share it on social, or they’ll just put it on YouTube or they’ll do something else with it. And maybe they should be doing those things as well, but it just kills me when you don’t see them also putting it on a landing page and using that landing page to collect leads or drive their business forward in some way. Dan: Put your video in an environment where it has a chance to actually, you know, hit those marketing goals — whether it’s lead gen or ticket sales or whatever. Kristen: Yeah, to do that sort of hard work for you. Dan: One tactic that you mention in your post that I love is using video to woo big name speakers who are trying to get to your event. Can you take me through where that event came from and how you go about it for a WistiaFest? Kristen: Sure. To be honest, I’m not even sure where this came from. It’s something that we’ve been doing here and there for awhile. And I guess it stemmed from a situation – and a few situations – where we found ourselves cold calling, if you will, or just doing sort of cold outreach to people and feeling so awkward about it. I mean I’m sure you are the same, Dan, where you have sent emails or even trying to make a phone call to someone you didn’t know and it just like feels really awkward. Dan: Story of my life. Kristen: Yeah, it feels awkward. I’m sure it feels awkward to them, too, frankly. Kristen: And it’s so easy for people to say no in that context. So our reasoning behind it is let’s give them a reason to say yes. You know, show them that you care and that you’re willing to go the extra mile and you know, give them a feel for who you are. I think maybe just knowing a little bit more about why you want them there — why you think they are uniquely qualified to speak at an event — can help tip them over the edge. I will say also, though, that this can fail sometimes. Like we have had situations where we’ve tried this and it didn’t actually work out. And I think that that can actually feel a lot more jarring or I don’t know, just disconcerting or uncomfortable than having somebody simply not reply to an email or say no in an email. So you know, I think that it’s important to approach it with a thick skin and recognize that hey, this is not going to work all the time. But as with anything, keep doing it and I think that ultimately it does yield great results. And you know, even if somebody comes back and says I’m sorry I just can’t be there, you’ve had a more meaningful interaction with them because they have seen your face and watched this video. And they will leave that experience with a much more positive impression of you and your company, I think, than had you just sent a regular email. Especially if you’re thinking about, you know, headline speakers that get a lot of requests. They get a million emails about this all the time so you know, differentiate yourself a little bit. Dan: Yeah, and they know that you’re not just sending the same form email to a thousand people saying: I really, really want you at our conference. You really want them and it’s clear, and I think that’s flattering to people and yeah, like you said, builds a relationship with them even if they don’t come. Dan: Okay, so let’s get to the big day itself: the event. Can you tell me how the search marketing conference SMX West used video while their conference was still going on to engage attendees, and I guess even people who couldn’t make it to the event? Kristen: Sure. So they, and I think a lot of other conferences these days are thinking outside the box about how they can use video during presentations, and even between speaker presentations or at the social events. And I recognize that occasionally this can feel scary to event planners because there’s always this uncertainty about whether the technology will work as you expect it to. But that is a very easily solvable problem. That is something that with a little bit of foresight and a dry run, you can eliminate as a concern. But I also think that looping in outsiders – you mentioned people who can’t make it to that event – I think this is huge. And it’s really incredible to me how people feel a little concerned about doing this. That if they loop in outsiders – you know – let’s say they’re letting people use Meercat or they’re even signing up for a live streaming video service – people seem to be concerned that it’s going to cannibalize ticket sales. Dan: Right, or devalue the experience of actually being there. Kristen: Yeah. And you know, I am not – I’m just not convinced by that. I think an event, yes; it’s about the talks and hearing those talks. But at this point, most speakers have video content of talks they’ve done online anyhow. So partially it’s about wanting to hear them in person, yes. But I think so much of it also is about the experience of being there and the other connections that you’re going to make, and the learnings that you’re going to have just on an ad hoc basis in the hallway or the discussion you have over lunch about a presentation you just heard. And I think so much of this is not possible to replicate just from watching a live stream of an event. And I think that – I would like to see more companies and more event planners embracing that and getting over that concern that it’s going to cannibalize their ticket sales. Because I think it’s a really important way to brand your event and get the word out there that it’s worth going to. And in year two, year three, I think people will reap the benefits of that openness. Dan: One thing that you guys at Wistia do better than anyone else, really, is using videos to introduce speakers at your conferences. Can you share some of your secrets there, or at least some best practices? Kristen: Sure. Well first of all, thank you. So we start out just by researching the heck out of all of our speakers and we want to know everything about what they care about, what they’re into. You know, ideally find some embarrassing photos from, like, high school or something where we can show a little bit of their past or sort of their funny sides. You know, I guess in terms of best practices, I think it’s great to poke a little bit of fun at the speakers because oftentimes the attendees feel as though the speakers are these gods and goddesses up on a pedestal, which is, I don’t know, maybe it’s valuable in some regard. I actually can’t think of why. I actually think, though, that it can be detriment – I mean I can see the cons of that pretty clearly. If you think of these speakers as gods and goddesses, any of the actionable tips that they’re giving you, you are more likely to just discount because you’re like, “Oh, of course so-and-so can do this. He knows everything about SEO. That’s gotta be easy for him but I don’t know if I could ever do this.” You know, whereas I think if you recognize that that speaker is just human and that they have foibles, and they have embarrassing photos from when they were at high school and whatever, you’re more likely to be forgiving if something goes wrong in their presentation. You’re more likely to put yourself in their shoes about how you can follow up and follow some of the recommendations that they offer you. Dan: That’s really interesting. I never thought about it that way. But yeah, totally. If you think they’re just gurus, then it’s like you’re watching a movie or something but it doesn’t seem actionable. Kristen: Yeah, yeah. Back to that sort of alibi thing. It’s too easy just to say that seems really hard. That person’s doing it but that’s because they are brilliant — they’re the CEO of this company. Dan: I guess that’s the difference between, like, writing at an event that’s like inspirational versus one that’s really actionable where you want to know that people could go back to work and implement those tactics. Kristen: Yeah, that’s a great point. I guess I think most about and sort of interact most with events that are designed to be actionable. So yeah, I mean that’s certainly what we’re always driving towards: helping people leave and actually go and do things differently and do things better because of the event they just attended. Dan: Totally, yeah. Well, this is the Call to Action podcast so we’re with you on that one. So once the event is over, you’re usually left with some good memories, sometimes some embarrassing photos, hopefully some new tactics to try out. But you write that video is also a great way to renew your vows with attendees. What do you mean by that? Kristen: As you were just pointing out, having somebody go and actually take action after the event, I mean that is the Holy Grail. That’s exactly what all of us are striving for is to create that feeling of inspiration but also that can-do attitude and excitement about going and implementing what they’ve learned. So I think probably the biggest thing is just about keeping the momentum and the enthusiasm going, and reminding people that they really can and should go and do those things. I mean my background is in education and in teaching, actually. So I have thought a lot about and read a lot about memory. And it is shocking how quickly people forget things. Like an hour after learning stuff, people remember like 20 percent and then a day later, it’s like 10 percent and a week later, it’s like 2 percent. I think considering that most people will leave immediately after and then they have the flight home, we are lucky if they are recalling even 2 percent of what they learned once they actually get back into the office. So helping to remind people what they want to do differently and what changes they want to make in their jobs and in their lives and in their companies I think is really the best way to ensure that they get the most value possible out of that event. Dan: Here’s one for you: speaker recording videos. Do you charge for them? Do you put them behind a lead gen form? Do you just let them run free? What’s your take on that? Kristen: Maybe I’m influenced by Wistia’s way of doing things, but in general, sort of the Wistia way of doing things is to make educational, helpful content as accessible as possible. And for us, that means free. We don’t sell any of our content. We just make it freely available. We rarely gate anything behind an email form because we want it to be as accessible as possible, sometimes to our own detriment, I think. But I think it’s important that companies who care about being thought leaders also make it easy for people to have access to speaker videos. And I don’t mean to say like an email form is undermining that; I think that’s a totally reasonable ask. I do think that it’s sort of a bummer when you see companies charging like $100, $200 whatever dollars for speaker videos – just because I can’t help but think about the educators, for example, who have a total of a $100 budget for their entire school year and can’t have access to that content. Or the nonprofits or even just the startups who looked a lot like Wistia looked in our early days. Dan: It does seem shortsighted, I think, in terms of spreading buzz about your event and getting it out there to people. Kristen: Absolutely, yeah. I totally agree. Dan: You end your post by reminding readers that, as with any campaign, you need to start with your goals. What’s the best way for marketers to figure out whether videos should be part of their campaign strategy? Kristen: I tend to think about marketing and sort of the goals of marketing in this way. I guess I tend to feel like as a marketer, you have won if you can get people to do one of two things: if you can get them to take some sort of action, and if you can get them to actually feel something. Taking an action oftentimes means buying something, but it could also just mean signing up for a newsletter or giving their email address. And you know, in terms of getting people to feel something, I cite that as a big win for marketers because when you get somebody to feel something, they will remember you. Our memories that are tied to emotion stay with us far, far longer than memories that are not emotionally charged. So you know, I guess in any context, when a marketer is starting to think about a campaign, I guess I would question what are the goals of the campaign. Like are you trying to get people to do something? In that case, probably video will help you get them to do it at a higher rate. Are you trying to get people to remember something about you or feel something about your brand? In that case, video is probably the right move. So yeah. I mean I guess probably most of what most marketers do drive towards one of those two things, if not both. So perhaps, unsurprisingly, I would almost say that I can’t really think of that many situations where video would not help you reach your goal unless it’s a budget or a time concern. Dan: I’d argue actually that those two things you mentioned are related: getting people to feel something and getting someone to take action. Because I feel like the emotion is often what spurs the action, no? Kristen: Yeah, that’s a really good point. I think probably we are far more likely to take action when our emotions are stirred up. I would like to offer a call to action. Kristen: We, I think, are in the very early days of video marketing right now. And this is so cool and so exciting and presents so many great opportunities for companies because so few people are doing it. So those of us who do tackle the perhaps daunting animal that is video have the opportunity to stand out and differentiate ourselves. The downside, I would say, with being so early days with video, is that there is so much that’s still unknown. And to your earlier question about conversion, like how does video impact conversion on a landing page, there’s not like a single right answer. There’s a lot of murkiness around what the answer is, or even how we’re phrasing the question. So anyway, I guess my call to action is get out there and use video more. But even beyond that, play around with it and test it and collect data on it, and share that data. Because I think that all of us as business professionals and as marketers and people who are thinking outside the box about how we’re presenting ourselves and our companies, we need better data. We need to have better answers and just have more people looking for answers about how we can do this well. Dan: Totally, yeah. And I think to circle back to what we were talking about at the beginning, often this stuff could seem more complex or difficult or even more expensive than it really is. And the best way to get over that hump is just to start shooting and testing and measuring, and just do it. Dan: Cool. Well, I think that is a great call to action to end on. So thank you so much for taking the time to chat, Kristen. Stephanie: That was Kristen Craft, Director of Business Development at Wistia. You can find her blog post in this episode’s show notes at unbounce.com/podcast. Interested in attending the CTA conference in Vancouver on September 13th to the 15th? Visit CalltoActionConf.com for more information. I hope to see you there.